Sourcing locally grown food has been top of mind for chefs since long before their clientele became aware of the benefits of local eating. Consumers with a conscience towards their social, environmental and economic responsibilities are now looking for menus with locally grown food and chefs are becoming more creative in their means of procurement. Owners and chefs are getting their hands dirty and planting their own gardens. With vegetable and herb gardens right outside their kitchen door, chefs can assure customers of quality and seasonal variety while helping to keep produce costs of the restaurant under control. While many urban restaurants have their own rooftop gardens or small plots of land outside of the restaurant, some of the more rural, country establishments can cultivate acres of land. Arrows Restaurant in Maine has earned international acclaim for both their menu and their sustainable garden that spans just less than one acre. According to a New York Times article, “their one-acre garden provides as much as 90% of the vegetables that they serve at their Arrows restaurant”. It may seem that all chefs dream of a garden right outside their kitchen but the owners and chefs at Arrows Restaurant built their garden due to necessity rather than a love of gardening. Fresh and interesting produce was not easily accessible and their need to create dishes including an array of interesting items mandated the creation of their garden. The French Laundry is the award winning restaurant of highly acclaimed chef Thomas Keller located in the Napa Valley. The restaurant sits alongside it’s 3-acre garden which provides much of the produce to the restaurant for it’s nightly 9-course tasting menu or the unique 9-course vegetable tasting menu. 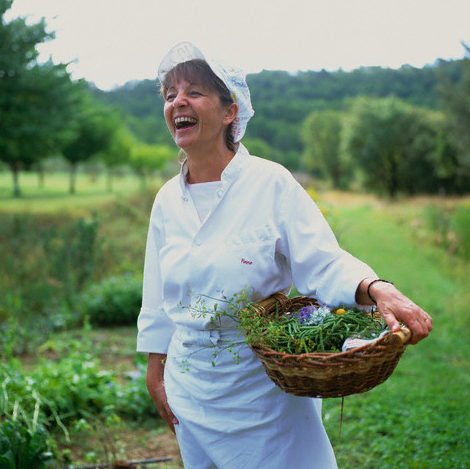 Look at the Seasonal Notes on The French Laundry’s website for a peak at what’s growing in their garden month by month. If you are interested in touring the gardens of a restaurant, a trip to Sooke Harbour House on Vancouver Island in Brtitish Columbia is in order. Whether you’re vacationing at their inn or simply taking in a dinner, a tour with one of the owners is a lesson is seasonal growing and sustainability. The next time you visit a restaurant that boasts fresh and local ingredients on the menu, pay attention. You may just be getting your food from somewhere much closer than you imagined.